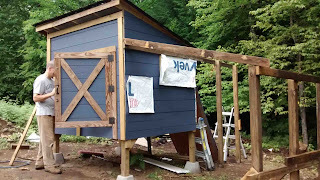 When last we left we were just finishing the platform for the new coop. Now, obviously much has happened since that long ago post. And here's the magical journey that got us to the end. First, we picked the location for the new coop. 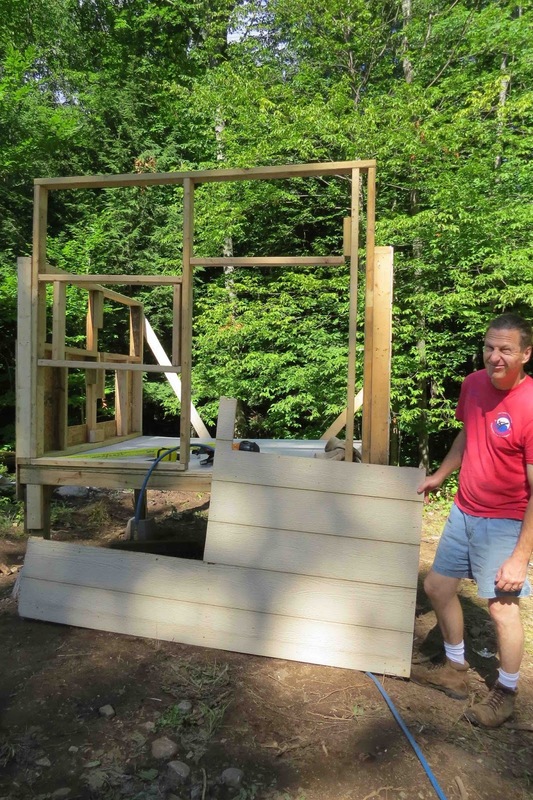 Then we sort of leveled the ground and built a platform. Then we built walls. We wanted to use the siding from the original coop so we wiggled a few things around to suit the adjusted layout (I flipped the nest boxes and pop door sides). Took a bit longer to get it all laid out and built, but saved us much money on materials. Unfortunately, things can easily go wrong when doing that kind of thing. For example, can you tell what's wrong in this photo? Sad face on Chris - why? If it's not obvious, there is no way that siding is going to match the door and window openings. We built the wall correctly, then installed it backwards. Argh. It was like a losing game of tetris. Fortunately we had an extra piece of siding and were able to recover without having to take the wall back down. 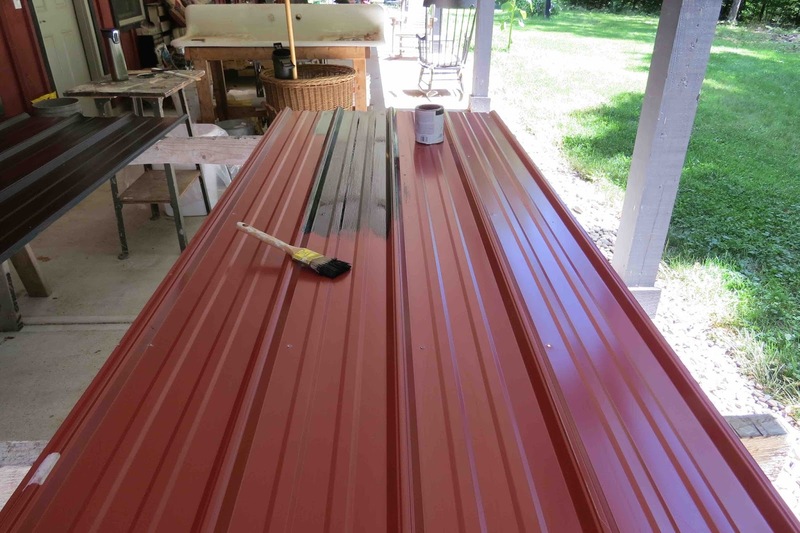 The original coop also had red tin on the roof. All of the tin on the property is black. Can you guess? Yup! Painted the tin black and it looks great, or at least looks good enough given that it's not particularly visible except from one specific direction. We changed the direction of the run too. 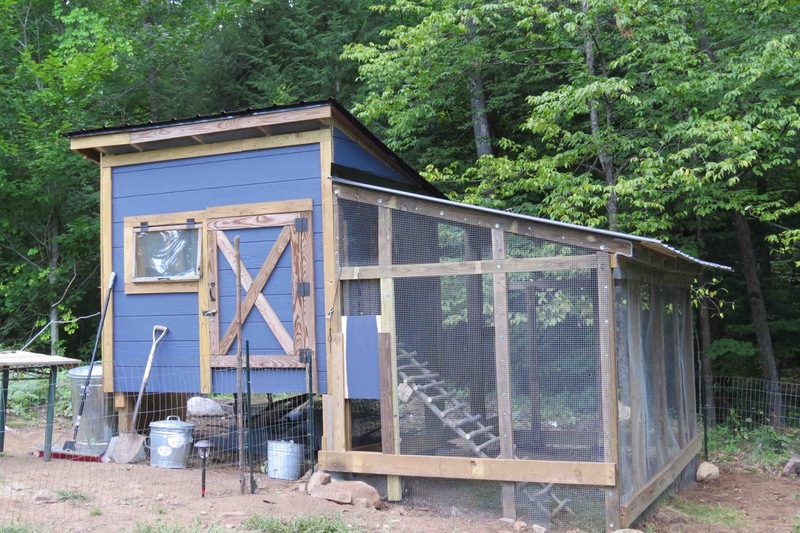 It used to run straight out from the coop but we decided it would look less imposing and provide better shade if we turned it 90 degrees (this is why we wanted to paint the roof tin; at this angle, it's visible when you drive up to the house). 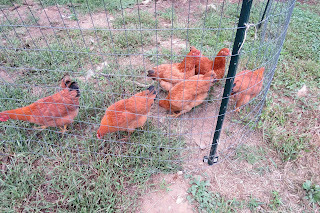 The chickens in the meantime did all kinds chicken stuff. They found the build to be very interesting and once we started letting them up there with us, it was hard not to trip over them. There are lots of windows for ventilation and both the front and back eaves are open to air. Every little gap has been covered in hardware cloth (boy, that took forever) and the run is secured with it too. We buried the cloth around the run to prevent digging underneath the walls and it's as safe as we're able (or interested) in making it. The big front door lets me get inside for cleaning (I can stand up in there) or just filling the internal feeder and waterer. 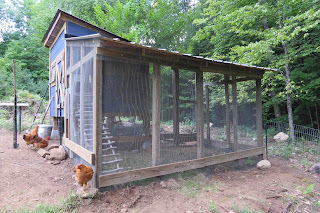 And I can easily reach the ropes that operate the pop doors without having to enter the run or coop (a big improvement over the temporary coop). 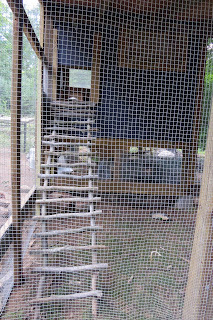 Inside I created a big roost that lets them easily hop up to the highest bar. 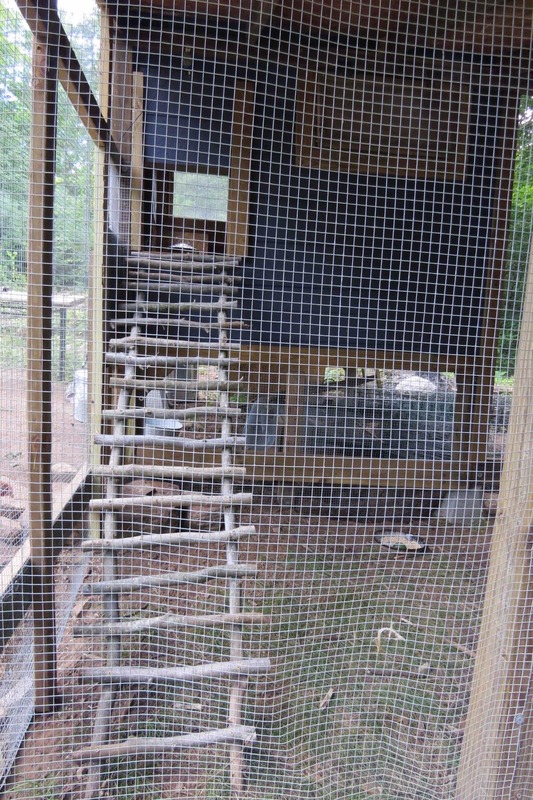 The bars are each at least 4 feet long so there is plenty of room for the chickens to claim position. And it's positioned so they roost right in front of the clean-out hatch that we put at floor level. Cleaning is now super easy - open the hatch and just scrape the poop into the transport tray. We installed linoleum on the floor and it makes it wonderfully simple to clean up. The nest boxes are just to the left of the roost bars. I'd seen suggestions that chickens like their nest boxes dark so we positioned them underneath the windows. They open from the outside so I don't have to get in the coop to gather eggs and I've already got them set up with straw, dried oregano, and golf balls as fake eggs. The birds should start laying this month so I'm prepping early. 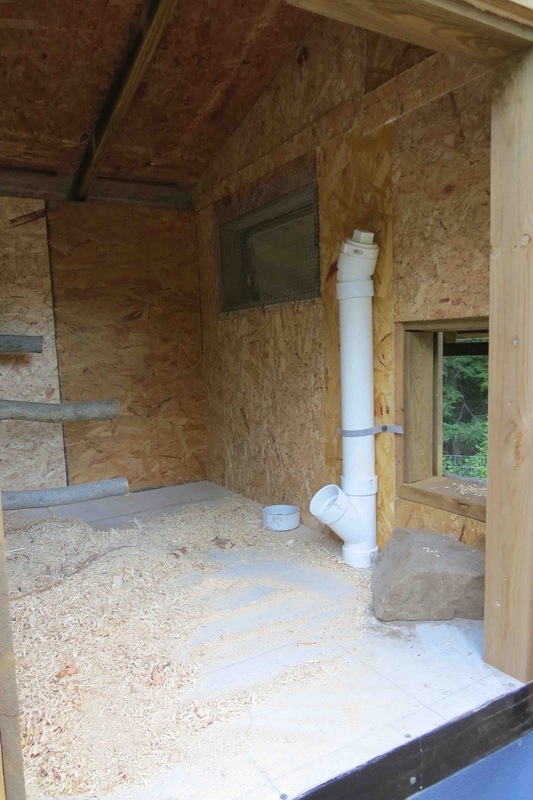 We moved the PVC feeder that we made from the temporary coop and attached it a bit lower on the wall in the new coop. Having it at ground level has resulted in much less mess. I'm feeding the crumblet in here - they're now eating it no problem. A small bowl of grit is also visible in the photo. I'll add a bowl of oyster shell once they start laying. 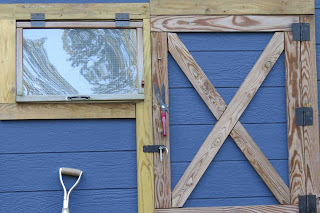 The pop door from the coop into the run is way off the ground so we needed to put in a ladder. 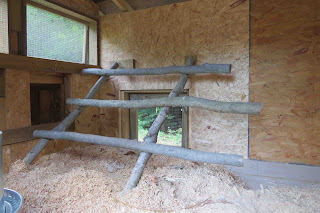 I had made a ladder out of branches for the temporary coop and decided to do so again. I did learn a few things though - like have many more branches than I thought necessary, use larger diameter branches, and put a small platform of branches in front of the door. 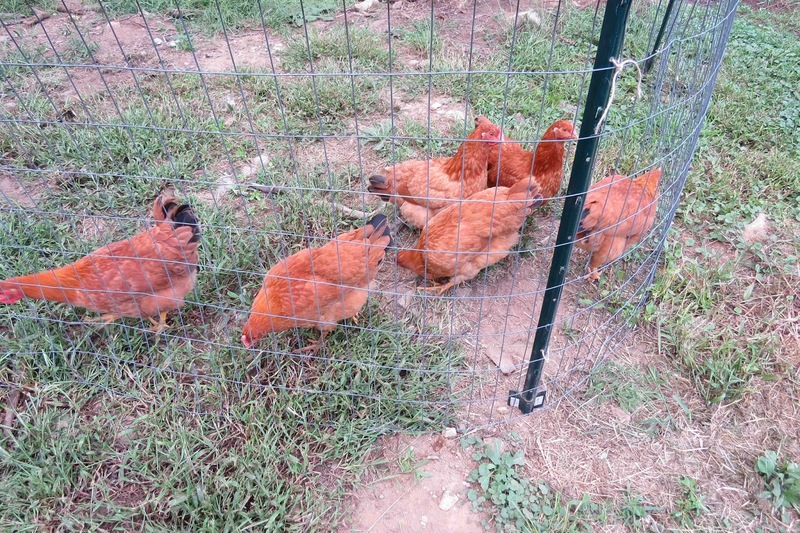 This gives them a good grip as they pause before entering the coop. And they always pause before entering the coop. There is typically a traffic jam at the door. I also made the ladder to easily detach from the wall so I can clean up in there without banging it. 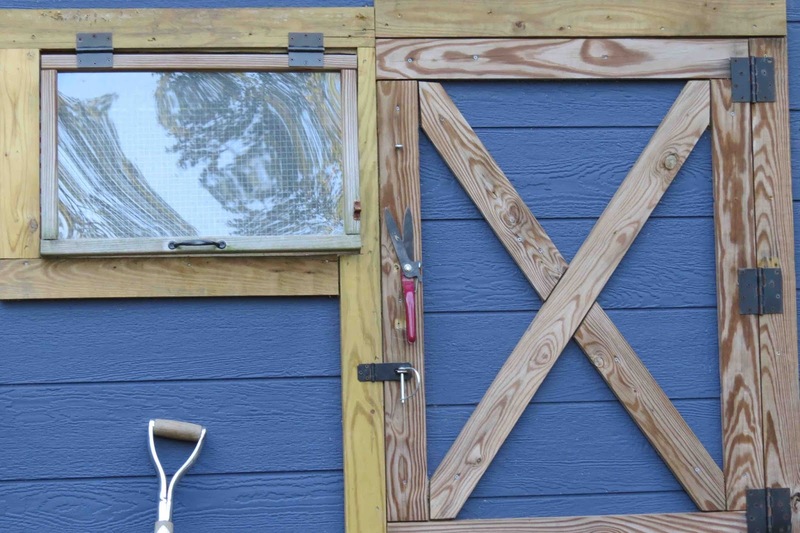 The pop door to the outside is right underneath the highest part of the ladder so it's out of the way too. In the far back right corner of the run is a man-door so I can go inside and clean or check on the birds. And I've already started on the decorating. 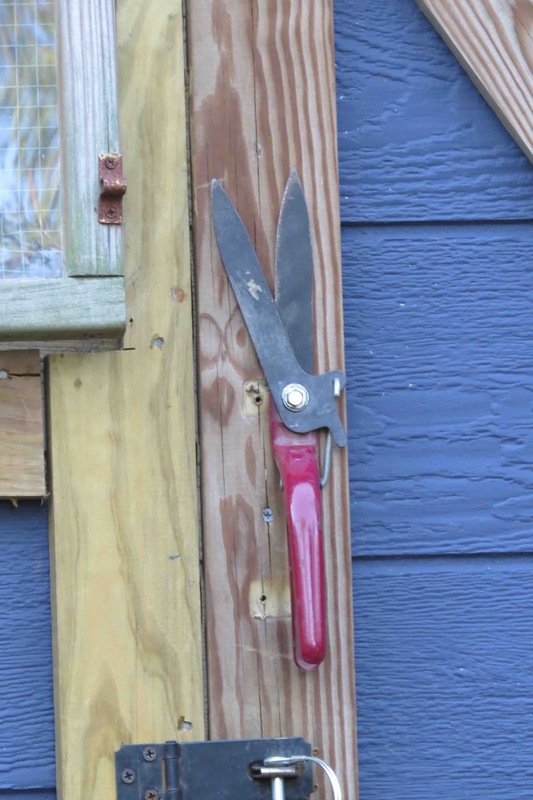 I had a pair of old garden clippers with an awesome red handle. Some minor modifications and they're now a nifty handle on the main door. I'm sure there will be more decorating to come. This area will be very visible once we get the garden in place up there and I plan to spend lots of time enjoying it.